Mary Kathryn is CYC certified and teaches crochet and looming at Michael's arts and crafts where she gets to embrace her creativity and play with new yarns as soon as they come in. She loves designing crochet projects for people who want Chiq things on a budget. Being a newly single mom of 2 she makes the most of her crafts skills to still look fabulous on a budget. 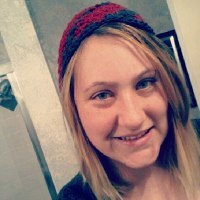 She learned how to crochet from patterns and video hosts here on Allfreecrochet.com and is excited to be able to give back and help others out there in the crochet community. I wish you would make more video' using the knook, you are very easy to understand. I love your patterns! Your sashy scarf instructions are the best!!! Took a class and they used the tiny "stitch" to frill the scarf. Thought it was a bit flimsy for my taste. Your way is easier, faster, and firmer. I'm in my 70s and don't feel it's the scarf for me, but wonderful for gifts. Thanks so much for sharing your patterns. Copied a few and plan to make the Christmas scarf this evening. Keep the patterns coming. so now that i've seen 'how to knook', where does one get a simple pattern to try out? Or does one just use a knit pattern? You can use any pattern I am working on a coffee cozie video this weekend for the knook. Is there a pattern you would like to see? A great scarf pattern is chain the width you want.... work one row of front stitch then one row of back stitch and repeat the 2 rows until you have the length you want! I am looking for a lace crochet pattern to crochet on the bottom of a pair of black pants (they are a bit too short & I want to add some length to them) any ideas? http://crochetchiq.blogspot.com/2012/03/how-to-add-cute-crochet-lace-edging-on.html This could work for shorts too! I Think "YOU" Did a GREAT JOB. Thank you so much Kvkalyn! Thank you for your support Ann! i can not see the patern on the anything clutch.